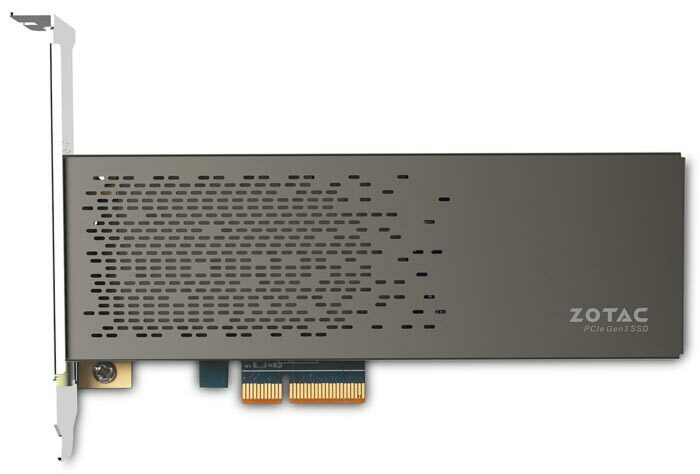 ZOTAC has launched its first PCI Express based SSD solution, the SONIX 480GB PCIe SSD. It says the new drive (probably the start of a range) targets enthusiasts and will be attractive for pursuits of serious gaming and productivity. As many readers will know the PCIe interface facilitates far greater performance than the same chunk of NAND in a 2.5-inch SATA form factor. Specifically ZOTAC claims "read and write speeds up to four times," better than a 2.5-inch SATA SSD. Important performance components of the SONIX as highlighted by ZOTAC are its NVMe 1.2 PCIE Gen3 interface with x4 lanes, its 512MB DDR3 of high-speed cache, its Phison E7 controller, and its stacked Toshiba MLC flash memory. As with any component in your PC, speed isn't the be all and end all, and ZOTAC has engineered the SONIX to offer reliability and durability with technologies such as End-to-end Data Path Protection and Dynamic Wear Leveling. The SONIX 480GB drive has a quoted MTBF of 2,000,000 hours. 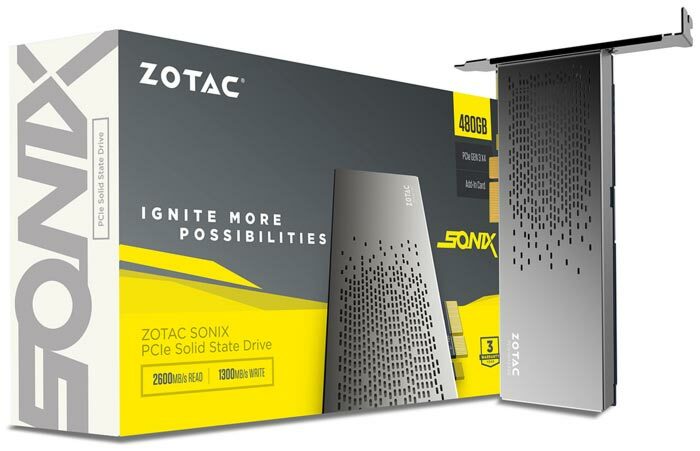 ZOTAC bundles its new PCIe SSD with both standard and low profile brackets and the flash storage chips are protected in a durable and stylishly minimal perforated metal housing/shroud. Pricing and availability details are yet to be released. Intel Optane DC persistent memory starts at $6.57 per GB Gigabyte Aorus RGB AIC NVMe SSDs listed MSI GL63 laptop with GeForce GTX 1650: promo slides shared Nvidia expected to roll out GeForce GTX 1070 with GDDR5X QOTW: Which AIB makes the best graphics cards? Really like the look of this drive, clean and understated, if they can get the price right then it can only do well for them. As nice as this is, it'll blatantly be at least £400-500, which isn't worth the extra speed over a SATA3-based SSD. Shave £200 quid off and I'd be interested.